1/2/14-1/3/14 And let the games begin…. Sunny and bluebird day after the day long storm that brought elevated winds good snow and low vis for a great day of storm skiing on Wednesday. Scooted around the north facing trees for both laps and enjoyed skiing the new snow as it accumulated. Nothing better. 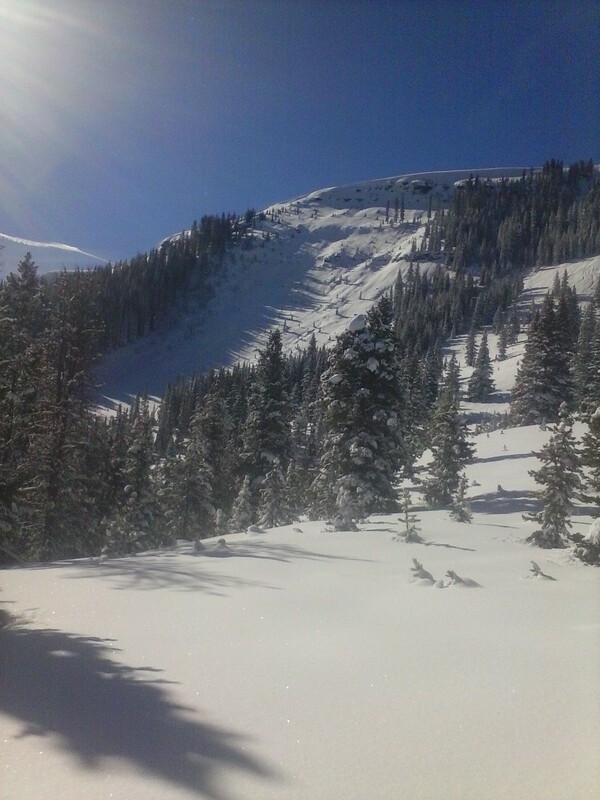 Thursday was the busiest day of the year(myguess) for Vail mouintain. Took an hour to weave my way through the throngs to get out. Found that the parade was on, regardless of the poma being open or not. Bluebird and about a foot of new. Wind slab concerns as the upper scarps of Benchie and Old Man’s were loaded. First run in Old man’s I found myself skirting the edge of a pocket release in the first slot skier left of treeline, rider triggered, as tracks entered by the rock band that creates the reef at the first rollover. Didn’t propagate beyond the width of the pocket or beyond the depth of the new snow, about 50 feet wide and ran to the beginning of the flats.SS-AS-R1-D1 new snow old snow interface, soft wind slab. My run was uneventful, excellent skiing conditions in settling pow. East facing warming quickly with intense sun,but early teleline tracks looked good in the morning. West Wall still not quite fully covered from it’s wall to wall rip a few weeks ago. Eying up the corner pocket, but will wait for another storm before testing it. Probably my favorite mandatory run in EV, gets the adrenaline going and usually something is following you, so sticking it is necessary. It’s the closest I’ve come to using the float 30 after blowing the landing and getting hit in the back by the following slab. I, being infallible, blame the elf shoes I was wearing at the time, Damn JJ’s.Sold them for a month’s rent in Bham. Saw a set of tracks through there today, Friday, nice to see it held above the rock band after the trees for those two. Second run spotted Matt B. and friends through gunbarrell, then skied through secret chute to trees, getting the goods in the dark north facing. Slots in benchie still a little boney for my taste, picking through the shrubbery not my preferred way to run there, but props to them for sticking it through there and sending it. As evidenced by the four foot trees guarding Mushroom Rock, it’s still a little thin to run clean. Good to see the usual suspects still around, and the crop of senders half my age as well. Hope we all have a safe year out there. See you on the skin track. Glad to see you back at it! While I work in Denver I live vicariously through you and your explorations! Thorough concise and legendary! Someday maybe, we can share a line:).